"Communication along the supply chain in the tooling industry" will be the motto of this event which will give the great opportunity for a technical exchange between end-users of tools on the one hand and manufacturers and further processors of tool steels on the other hand. The basis of the ongoing progress in the field of TOOLING is given by the scientific community from university that supports industry by application oriented research which will be presented at this conference next to contributions from industry. We are delighted to invite you to DMIUT 2019, which will take place in Gdańsk (Poland) 29–31 May 2019. The aim of the DMIUT 2019 conference is the development and proliferation of novel diagnostic methods of steel materials and industrial component state assessment, focused on the detection of microstructural changes, as well as on the residual stress level evaluation of exploited elements. This forum will also unite experts in steel health monitoring. 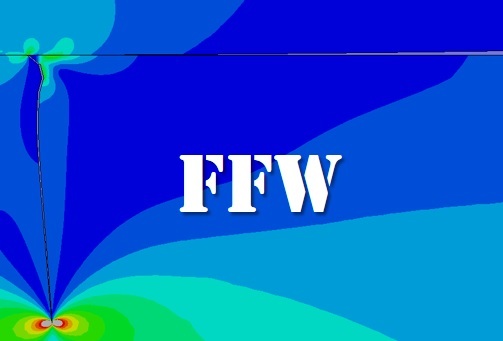 The electromagnetic methods appear to be the most effective steel state assessment methods and thus novel ideas of such types of diagnostics should also be presented and proposed to industry end users. MSME 2018 is organized by Hong Kong Society of Mechanical Engineers( HKSME), supported by Sinon French Association for Sciences and Technologies (AFCST) and Association ASMDO. The conference will serve as an international forum for the presentation and exchange of technological advances and research results in the broad fields of Materials Science and Manufacturing Engineering. The conference will bring together leading researchers, engineers and scientists in the domain of interest from around the world. Welding technology is an important technology that involves the joining of two or more pieces of metal or thermoplastics together in order to form a single piece. This technology is applied to many of processes in the manufacturing industries and their products, such as automobiles, vessels, ships, airplanes, bridges, pipelines, etc. All welding techniques are continuously growing and new welding methods, welding, and the characterization of new materials are being investigated in order to satisfy new demands and needs from customers. The welding industry is continuously looking for a way to increase and improve the welding method, process efficiency, and welded joint reliability. Thus, major producers, scientists, engineers, and researchers have gathered at the ICWET18 event (https://icwet.ius.edu.ba/tr) in order to share their preoccupations, challenges, and possible solutions. This 5th International Conference on Welding Technologies and Exhibition (ICWET18) is one of a series, held regularly, at two-years intervals. Selected contributions of the 8th International Congress on Science and Technology in Ironmaking—8th ICSTI 2018 will be published in the Special Issue. The congress will be held form Sept. 25 to 27 2018 in Vienna and will bring together a wide range of experts, coming from plant operation and plant and equipment suppliers, as well as research institutes and universities, who share expertise in the field of ironmaking. The scope and topic of the contribution to the 8th ICSTI 2018 covers the topics cokemaking, iron ore production and handling, sintering, pelletizing, blast furnace ironmaking, direct reduction, smelting reduction, environmental control in coke and ironmaking, CO2 reduction and energy saving, recycling of in-plant residues, and automation and digitalization in coke and ironmaking, as well as modelling and simulation in coke and ironmaking. field attend the seminar and present their latest results in the calm atmosphere of an ancient castle. 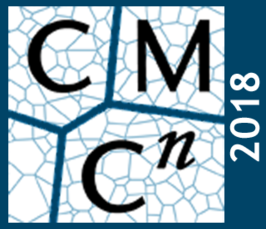 CMCn2018 The Max-Planck-Institut für Eisenforschung in Düsseldorf is organizing the 6th International Symposium on Computational Mechanics of Polycrystals and we would like to invite you and your research colleagues to participate in this event. This symposium is part of a biannual series of symposia that originated with the establishment of the first joint research group formed between the Max Planck Society and the Fraunhofer Society and investigating Computational Mechanics of Polycrystals. This year the symposium is again combined with the DAMASK User Meeting. 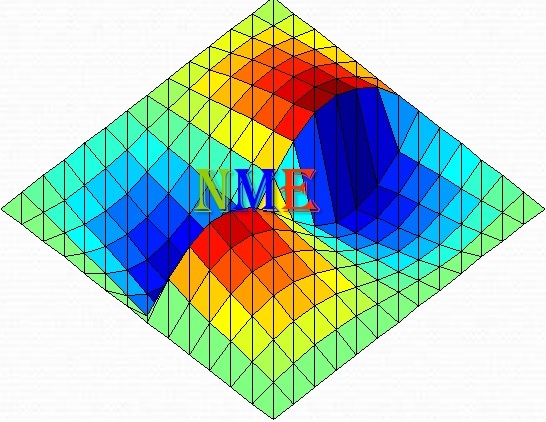 DAMASK is the multi-physics simulation software developed at MPIE. The symposium will take place on September 17th and 18th, 2018 in the Max-Planck-Institut für Eisenforschung at Max-Planck-Straße 1, 40237 Düsseldorf, Germany. The DAMASK User Meeting will be held on the following day, September 19th at the same location. If you and your colleagues would like to attend this event, then please register before July 15th 2018. We emphasize that registration is mandatory and that there are limited places only. Many thanks, we hope to see you in Düsseldorf! The 3 rd International conference on Computational methods in Manufacturing Processes (ICOMP’18) will provide an excellent intercommunication opportunity for researchers working on this multidisciplinary field of scientific endeavor. This conference brings together researchers, practitioners and new comers to the field in an international forum. This community addresses recent advances in development or application of new numerical methods and pioneering computational strategies dedicated to manufacturing processes. It will also serve as mean that strengthens relationships between industry, research laboratories, and universities. The first international conference on Numerical Modelling in Engineering (NME 2018) will be held in the city of Ghent, Belgium. The overall objective of the conference is to bring together international scientists and engineers in academia and industry in fields related to advanced numerical techniques, such as FEM, BEM, IGA, etc., and their applications to a wide range of engineering disciplines. The conference covers industrial engineering applications of numerical simulations to Civil Engineering, Aerospace Engineering, Materials Engineering, Mechanical Engineering, Electronics, Electrical Engineering, Biomedical Engineering, etc. The seventh international conference on Fracture, Fatigue and Wear (FFW 2018) will be held in the city of Ghent, Belgium. The overall objective of the conference is to bring together international scientists and engineers in academia and industry in fields related to Fracture Mechanics, Fatigue of Materials, Tribology and Wear of Materials. The conference covers industrial engineering applications of the above topics including theoretical and analytical methods, numerical simulations and experimental techniques. One of the aims of conference is to promote cooperation between international scientists and engineers from a large number of disciplines, who are involved in research related to Fracture, Fatigue and Wear. Welcome to visit our booth to chat with our delegates. The scientists and entrepreneurs working on steels and iron alloys are welcomed to attend the 3rd International Scientific Conference: Modern Steels and Iron Alloys MSIA’2018, which will take place on the 26-29th June 2018 in Warsaw, Poland. The goal of the Conference is to create a platform for communication and cooperation among scientists, engineers, entrepreneurs and investors in the area of application of new steels and iron alloys and implementation of innovative heat treatment technologies into the industry. 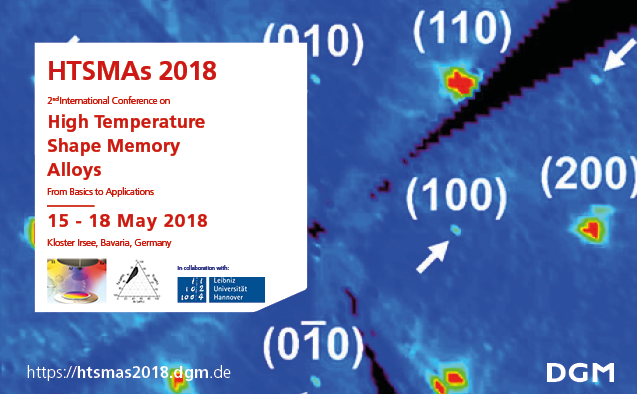 The 2nd Conference on High Temperature Shape Memory Alloys, which will be held from 15th - 18th in the Kloster Irsee (Bavara, Germany), will provide a setting for all those interested in basic aspects and applications of high temperature shape alloys. There will be ample time to exchange ideas and discuss the latest research. The conference is expected to shed new light on the different aspects of the processing-microstructure-property relationships, characterisation, testing, and modelling and last but not least on applications of high temperature shape memory alloys. TMS2018 will connect minerals, metals, and materials scientists and engineers who work in industry, academia, and government positions around the world. The event will draw more than 4,000 attendees and feature four full days of technical programming, 85 symposia, two poster sessions, numerous networking opportunities, and a dynamic exhibition hall. Metals will have a booth on TMS 2018. The Booth number is #322. Welcome to visit our booth! The 2nd International Conference on Light Materials--Science and Technology (LightMAT 2017) gives a comprehensive overview and new insight into the three most important light metals Aluminium, Magnesium and Titanium and their combinations. LightMAT 2017 addresses industry as well as academia and intends to strengthen the link between the two. Furthermore, the conference promotes the participation and the networking of young engineers, scientists and students. ICSOBA was formed in 1963 in Zagreb (Yugoslavia), in the past half century it has become a well recognized and truly international organization. The main objective of ICSOBA is to promote the exchange of ideas and results of the work from different fields of research related to bauxite exploration and mining, and alumina and aluminium production. Since 1963 some 34 ICSOBA events - symposia, congresses and seminars - were organized in different parts of the world and proceedings were published as printed Travaux volumes until 2010, and as electronic files thereafter. The theme of the Conference is Metallurgy and Materials Impact on Society. The industrial world of metals and materials keeps changing. The pace of change and intensity of competition increases; society demands better products and cleaner technologies. All metals and materials professionals from their different posts of engagement, being these industry, government or academia, work to meet the new challenges. Global partnerships and technological innovation is the assured way by which we can achieve our goals. The technical program will feature papers from all fields of minerals, metals and materials technologies; but the conference focus will be a number of key international symposia. In addition to the technical program, the conference will offer a Metals Trade Show, Short Courses, and Technical Tours. Organized by MetSoc of CIM. The LMT conference has become a biennial event hosted in a different country selected by the six members of the global light metals alliance, an alliance of the world‘s top light metal research centres. You are cordially invited to attend the 5th International Light Metal Technology Conference which will be held in Lüneburg, Germany from 19 July–22 July, 2011. The research and scientific focus of the conference concentrates on aluminium, magnesium and titanium alloys as well as titanium aluminides. It provides an opportunity for researchers and industry to learn of new developments in light metals technology and to facilitate collaboration between domestic and international specialists in the field. It is a great opportunity for those involved in the light metals industry in Germany to learn about the latest developments in light metals research conducted worldwide. The LMT conference cuts across conventional S&T boundaries by concentrating on light metals technology rather than general aspects of metallurgy. The conference focus is on leading edge technologies that are being developed by researchers in cooperation with industry partners. To this end, the conference will feature invited presentations from high profile industry representatives and international researchers in the field. We expect approximately 250 delegates at the conference, which will be accompanied by the publication of all invited papers in the form of professional, hard-cover peer-reviewed conference proceedings. LMT2011 will attract leaders and decision makers from industry, government, universities and public research organisations committed to advancing the application of light metals in everyday life. Representatives from the primary metal, automotive, aerospace, defense, biomedical and research sectors are only a few of those who will attend the conference to discuss and present on the latest developments in the field. More than 16 countries usually send delegates to the conference, which will have a mix of ~ 40% domestic and 60% international delegates. Welcome to Germany in 2011! The 6th international European Metallurgical Conference, EMC 2011, will be held in Düsseldorf at the Congress Center Düsseldorf (CCD) in June 2011. Organized by the GDMB, the German Society for Mining, Metallurgy, Resource and Environmental Technology, the conference will be focused on the efficiency improvements for resources and energy in the non-ferrous industry based on the primary and recycling metals industry. The increasing energy costs, the more complex resources and scraps leads to the point, that the new as well as the existing material and energy flows has to be optimized or new designed. Therefore the process efficiencies and the energy recoveries and savings are the major topics of this conference. These themes are quiet interesting for the metals-producer, equipment manufactures, engineering companies and consulting business and manufacturers of heat and energy system.